I have news…I’ve had my baby girl! We had her on the 10th April. The birth was fairly fast to be honest…My waters broke at 1am and I had her by 6am. By 1.30am I started having surges which more or less became fairly strong within half an hour! They were already a minute long and five minutes apart from the get go! But I remained calm and just sat on the sofa, closed my eyes and did deep breathing for the next four hours. When we rang city hospital when my waters broke and told them how my contractions were…They told us it’s probably not contractions as that’s too fast and it may be period type cramping pain to begin with. Obviously it wasn’t but I think that it actually helped to play down what I was experiencing and helped me get through it. We had another hiccup….City hospital had no records of our transfer to them (even though it was confirmed a week before!) So Mizan was on the phone to and fro from one hospital to another trying to work out where we need to go! He spent 45 mins on the phone and by this time I was really uncomfortable and felt like I should be at a hospital! But I didn’t let the change of hospital phase me…Mizan was really angry inside but he decided.not to show it as he didn’t want to freak me out. We finally arrived at (the right) hospital at 4.45am and when they examined me I was 8cm! However, I felt they didn’t really look at my birth preferences and I was whisked into the delivery suite. We had to wait another 20 minutes for someone to tend to us which felt like the longest 20 mins ever! I had asked for water as I was so parched from the deep breathing and they took their jolly time! Have to admit towards the end of the 20 minute wait I did lose control a bit as i just wanted water!! When they came I was put on gas and air for the rest of the delivery which helped to take off the edge. I just carried on doing deep breathing into the gas and air tube. My blood pressure dropped too low towards the end though and I ended up having some assistance to get her out. All in all I would say labour was easier than I was expecting….Staying calm and focused really helped the hours fly by and no doubt hypnobirthing played a huge part. I was anxious that I wasn’t prepared enough but in the end I managed to pull it together. Mizan was a great birthing partner too he comforted me the whole way either by holding my hand or rubbing my back. Thank you so much for your invaluable guidance and support. I am a true believer in hypnobirthing! I think it’s the reason why I had a quick delivery…I let my body just get on with it and worked with the contractions not against them. I am preaching hypnobirthing to whoever needs to know about it! And I am highly recommending you along with it too….Thank you again. I was getting fed up as I neared a week overdue. I saw the midwife on Tuesday morning and politely declined a sweep or induction as deep down I knew that baby would come when ready and not when everyone else told me…I hated the pressure of being overdue again, but kept reminding myself that we weren’t quite ready. I went for a long walk on Tuesday and bounced on the ball for hours practising my breathing. I was getting a few mild pains but I didn’t think much of it. By about 9pm that evening I was getting more discomfort and braxton hicks but nothing major so I watched a nice film and went to sleep listening to affirmations. I woke at 1.30am with a definite surge but managed to breathe through it fine. More surges started soon after but I was managing them really well just using surge breathing and listening to the affirmations and I couldn’t believe how much it helped. I really felt like I was breathing so much oxygen into my abdomen and that it completely changed the way I experienced the sensations (compared to my previous birth experience). Tony, my husband, was due to take Eva (our daughter) to the childminder at 8, but by about 7.20 I suggested maybe we ask the childminder to pick Eva up for us as I felt I couldn’t let Tony leave… She arrived to collect Eva at 7.45 and then after another two very big surges we decided it was definitely time to get to Solihull Hospital. I took one step down the stairs and had the biggest surge I have ever experienced and my waters gushed everywhere and suddenly I had a huge and uncontrollable urge to push! I put my hand down my leggings and could feel his head starting to emerge! Tony called an ambulance and somehow managed to carry me back up the stairs and into our bedroom where I got on all fours on the rug. Two paramedics (neither of which had ever delivered a baby!) arrived and said we needed to go to hospital. I (not very politely at all) told them that there was no way I was moving! Within 5 mins the head was out and then his body followed a few minutes after. Tony helped to deliver him and cut the cord once it had stopped pulsating. It was very intense at the end, and I definitely wasn’t quiet (our poor neighbours must have got a fright!) but I was so glad that I managed it and that everything was OK. It took about 40 minutes for the placenta to come out, which was actually the worst bit because I was really struggling to hold him or do anything because the surges were still so strong. When it finally came out we were taken to Solihull Hospital where I had some stitches and we both got checked over. I was in a bit of shock (all a little too quick) and we ended up staying the night which was nice. In retrospect, I should have really gone to the hospital at about 6am as I had started to really moan through the surges without being able to stop the noise and I sensed that something had changed, but as I was still coping so well I thought I would carry on for a bit longer. My lovely cream John Lewis rug will never be the same again, but it was all worth it. Edward, (Woody to us) was born at 41+8 and 7lb15, exactly when he was ready! The breathing techniques helped so much to keep me in control so thank you for everything! Sliding Doors- how can your decisions impact your birth? Sometimes deciding to do something which is a bit (or a lot) outside of your comfort zone can feel really strange. But what is the impact of NOT getting out of your comfort Zone? I bet most of you have seen that lovely Rom Com Drama “Sliding Doors” staring Gwyneth Paltrow …where two versions of one person’s life run alongside each other at the same time…and the viewer gets to see both versions of that life… Well let me take you through a little Sliding Doors scenario right now, to help you understand the impact that the decisions you make can have on your life. In this ‘movie’ Gwynee isn’t the star. Let’s give YOU (the heroine in this story) a name. I’m gonna call you Belle*. One day, Belle, who is 20 weeks pregnant, visits a local Baby & Pregnancy Fair. She has gone with the intention of finding a local yoga class and picking up a few bargains for the baby. Belle notice’s a woman with long, red hair and a friendly face, chatting to some other pregnant women. They are exchanging details and talking quite intently. Intrigued, Belle makes her way towards the lady. The lady introduces herself as, Liz (c’mon- I was always gonna star in my own movie!). Liz begins to talk to Belle about the Antenatal Course she teaches. It’s called Hypnobirthing. Belle is vaguely familiar with the word and so listens to what Liz has to say. This is the sliding door moment. Belle can either smile politely, declining any further information or she can decide to book onto a course (Liz is running some good offers at this fair!). The Belle who decides to not to do Hypnobirthing actually says to Liz. “I have a really low pain threshold, all my friends have had horrible birth’s, I am just going to take all the drugs I can and hope for the best. Thanks- Bye!” This Belle walks away and carries on with her pregnancy. She pushes away the fear, rushing from her job to home and vice versa, trying to sleep at night but struggling due to the anxiety which is beginning to creep in. She hasn’t done any real preparation. She never does get round to doing that yoga class either. Her partner, is a lovely supportive person but doesn’t really know how to help her during her pregnancy or during labour and so he is feeling anxious too. The big day comes. Labour begins. All those horrible stories from her friends come rushing to her mind in images and words. She thinks “this is going to be so awful and painful…I can’t wait for it to be over”. In response to those thoughts, Belle’s body tense’s up, she holds her breath, grits her teeth and just waits for the contraction to be over. This goes on for what feels like hours when eventually Belle goes into the obstetric led unit at her local hospital. There is no birth centre just a delivery suite environment which Belle had selected because she thought it was the safest option. Belle has never visited this hospital before today and upon entering her new environment, her fear increases and her contractions decrease. When she is examined, Belle is told that she is 4 cm and can stay in the hospital. Belle feels gutted…it feels like it has taken so long to get to 4cm, she doesn’t know how much longer she can go on for… Her contractions have come back but she isn’t making as much progress as the midwives would expect. The doctor wants to speed her labour up and Belle, not knowing there are other options, goes ahead. Her contractions become stronger, the pain is unbearable now, she is so afraid. She asks for pain relief. Again, Belle doesn’t know what her options are or anything about the drugs on offer. When the drug takes effect, she feels the pain dim but not go away. She begins to feel spaced out, not in control and her fear increases. Eventually, Belle becomes exhausted. The midwives and consultants are concerned and so they intervene. It feels like there are a lot of people in the room, coaching her on when and how to push, the cord is cut immediately, after a minute or two, Belle’s baby girl is passed to her and she feels relieved that her ordeal is now over. She can concentrate on getting to know her baby. But she can’t shake the feeling that it could have been so very different. Let’s go back to the Sliding Door moment at that Pregnancy and Baby Fair. This Belle has decided to book onto the Hypnobirthing course. The course begins in two weeks and Belle and her husband, Tom, are looking forward to it. Even after the first session Belle begins to feel calmer. She understands the mind/body connection which is something she has never thought about before. In earnest she begins to listen to her MP3’s and looks forward to each weekly Hypnobirthing session. Belle learns how her body works and how to work with it, she learns about what happens during labour and how to help increase the flow of Oxytocin and Endorphins. Tom learns how he can support Belle and he completely understands what his role is. Together they finish the course knowing all this as well how the induction process works and how Hypnobirthing can help in Special Circumstances. Armed with a toolkit of breathing and relaxation techniques Belle and Tom continue their practice at home, listening to the MP3’s daily. Belle feels positive, is enjoying her pregnancy and even looking forward to the birth. Belle and Liz stay in touch throughout the rest of the pregnancy and when Belle has a wobble at 36 weeks, Liz is there to help her get back on track. The big day arrives. Labour begins. Initially Belle feels anxious but she talks to Tom, practices her Calm breathing and soon she feels calm again. As labour progresses she can’t believe how effective her breathing techniques are and she feels so in control. Her body is relaxed and she visualises her body opening and expanding- doing the job it is designed to do. She runs her favourite affirmation through her mind “Your surges are not stronger than you because they are you”. Tom has been timing her surges and together they decide it’s time to head to the Birth Centre. Belle spent a lot of time looking at her local hospitals and birth centres and settled upon one which was 20 minutes from her home. When she arrives, the midwife greets her with a smile and notices how calm she is. “Are you doing Hypnobirthing?” she asks. Belle is elated that her midwife seems to know and approve of Hypnobirthing and immediately begins to feel relaxed in her care and in her new environment. Belle decides she would like a vaginal examination at this stage but that she doesn’t want any more unless it’s necessary. The midwife tells her she is 4cm. Belle is elated! Established labour! The midwife says she will start to fill the birthing pool soon and Belle and Tom settle in. Tom puts up some affirmations and starts to play Belle’s MP3’s. He gets out the aromatherapy oils and then applies some Light Touch Massage to Belle’s back. Belle starts to “moo” after some time and make some deep throaty noises. Tom feels hopeful that things are progressing quickly! Belle gets in the water and it isn’t long until she feels the need to breathe her baby down. She panics a little as her body starts to push her baby out. It’s a feeling like no other! Tom gets Belle to look him in the eyes and he reassures her. They breathe together and she feels calm again. She takes her time, going with the lead of body and eventually she feels her baby’s head crowning. The midwife encourages her to keep doing what she is doing and Belle takes comfort in that. When the baby’s head is born, Belle knows that it won’t be long until she feels her baby in her arms. Another surge of her body and Belle slowly scoops her baby up in her arms and holds her close to her chest. She feels elated! She did it!!! Her baby looks into her eyes and Belle has never felt love like it. The cord ceases pulsating and Tom cuts it. He feels so proud that they both worked as a team to create such a positive experience. Belle’s decision NOT to do Hypnobirthing impacted her whole pregnancy. She was frightened, ill-informed and Tom didn’t really feature in her birth experience at all. But the Belle who decided to give Hypnobirthing a chance had a totally different experience. This Belle begins parenthood confidently and feels self-assured. So, here is your “Sliding Door” moment…. On the 21st January I am holding a FREE Hypnobirthing Taster session. If you want to find out more about how Hypnobirthing can help you prepare positively for labour and birth send me an email to liz@enhanceyourbirth.co.uk and I will book you on! Our little girl was due on 5th October – my husband Alex’s birthday!! I had heard wonderful things about hypnobirthing from from colleagues and being the first of my friends to have a baby, I was keen to face birth with a positive and calm outlook! My birth, however, wasn’t the start that I imagined! My waters broke at 3.30pm on 2nd October (after a sneaky drive thru large Big Mac meal and strawberry milkshake!!) at home, which was a bit of a surprise. I called the hospital and they advised us to come in for an examination as my contractions hadn’t started, but said we would probably be coming home after. We took the bags just in case. When we arrived both mine and baby’s heart rate were high and we were placed on a monitor for a few hours – during which they noticed several dips in baby’s heartbeat which they thought was cord compression – and advised it would be safest for baby to induce right away, but to be prepared that if her heartbeat continued to fluctuate it may be an emergency C-section. At this point I will admit I was so frightened- this wasn’t the calm water birth with early labour at home that I had imagined. I hadn’t even brought my birthing ball! However I knew that I was making the right decision for baby, and consented to the induction. After a brief few hours sleep and a failed pessary, they started the drip at 9.30am on 3 October. I couldn’t move off the bed, strapped onto the heart rate monitor but I listened to my affirmations and Alex kept reminding me to breath deeply and fill my abdomen! I listened to the affirmations but couldn’t relax, there was a woman next door screaming so loudly! So we put on Michael Buble, which wasn’t in the plan but did he trick. As my contractions got more intense throughout the morning we had the television on and watched a bit of homes under the hammer and this morning until 12.30 when I reached for the gas and air! Thea Isabelle Clarke was born just a few hours later at 15.07pm, just 1 and a half hours after I had asked for an epidural and was told I was fully dilated! There were a few moments when the midwives wanted to allow the doctors to intervene. 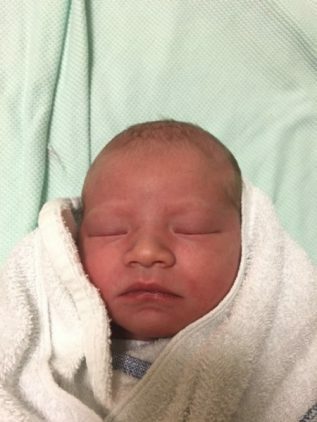 I used my hypnobirthing techniques to visualise her moving down – I was determined to deliver her myself and I did – all 9lbs! I said to Liz at the start of the course that what I wanted was to feel proud of myself – and I really have never felt prouder. We didn’t have the birth we imagined, but we did it! “Screw the birth prep…I’m gonna wing it”…. This (or something similar) I hear quite regularly. From educated, intelligent women. Women who revised for their GCSE’s, NVQ’s, A Levels, Degrees, Diploma’s so they had the knowledge and information that they needed. Women who practised driving prior to their test so they could feel confident. Women who researched for interviews. Did practice questions and answers so that they were aware of the latest developments within their careers. And knew as much information about the prospective employer as possible. Women who thought about what they were going to wear on a first date, considered what the atmosphere would be like, how to connect with their beau (lots of batting of eyelashes and fancy knickers etc!). Yet, when it comes to what is ultimately THE most important moment of their lives…the moment when they they bring their precious baby into the world and begin the life changing process of becoming a parent, they opt for…winging it. There must be a reason why women choose not to educate themselves about birth. Why they choose not to practice breathing and relaxation techniques. Why they don’t consider making an informed choice about where to birth their baby. Why they don’t think about the environment in which their baby will born. Could it be fear? Fear of standing out, being different to others. Fear of things not working out as they had planned. Could it be tunnel vision? We are all so programmed to believe that birth is this horrible experience we have no control over…is it just too hard for people to think it could be better than that? If they think it’s going to be awful anyway perhaps there isn’t any point in doing any prep. Could it be blind faith? Total and utter faith in your body, that it knows what to do…so why do anything? They take time to connect and bond with their baby. Preparing themselves for parenthood. They feel positive about their upcoming birth and empowered to make decisions. Their partners know how to support them because they have been through the classes together. Women who prepare for birth using Hypnobirthing make such massive changes to their mindset and the way they feel about birth, it transforms their pregnancy, birth experience and even impacts their whole lives for the better. Why wing it? Why chance it? You only get one shot at each birth- so make it the best most positive experience it can possibly be. Book onto one of my FREE taster sessions (run monthly) or try the first session of Hypnobirthing for FREE in November. Email liz@enhanceyourbirth.co.uk to find out more. Did Bridget Jones have a positive birth? Last night I went to see “Bridget Jones’ Baby” and I literally cried with laughter all the way through. I even found the birthy bit funny and actually saw some real benefits to the portrayal of birth within the film. I could bang on about the really negative reflections of birth that I saw and how damaging they can be to women and their birth experiences but I chose to see the positive instead. It’s a real bug bear of mine to have to watch women in labour on the telly or in films and see what should be the most empowering moment of our lives shown in such a damaging light. We have OBEM inflicted on us every year and then every soap, boxset or film I watch, showing a women in labour, makes me eye roll, shake my head and tut. So it came as surprise, just how funny and positive I found this film. But other than that- she rocked it (or rather the film producers could have portrayed the birth in a much more negative light). If this was a real birth I would be wanting to high five Bridget and tell her how incredible she is. No drugs, no intervention, all natural vaginal birth. During her pregnancy, she and her birth partners attended antenatal classes and learnt massage techniques and how to breathe (the breathing Bridget ended up doing during labour was more likely to cause her to hyperventilate than actually help but still…). Seeing as a ridiculously low number of women don’t even attend the FREE antenatal classes that are available from the NHS and by private companies, it was nice to see that Bridget, and her 2 birth companions attended the classes, enjoyed them and learnt a thing or two as well. In my classes I suggest to the Birth Companion that he/she does WHATEVER is needed by the birthing mother and that they need to be aware that their mind-set will have a massive impact on how Mum feels and responds in labour. So it was good to see Mr Darcy doing whatever he HAD to do to support Bridget which at one point involved carrying her through the streets of London to the hospital because she didn’t want to walk. It was also lovely to see their connection with one another during labour- that is something else I emphasise in my classes. Feeling connected, close and supported by your partner really helps with the release and flow of the hormones which you need to feel as good as possible in labour and of course to keep your labour progressing. We didn’t see the baby actually being born (and the birth companions weren’t there for that bit- which was disappointing…something about their favourite pub being burnt down???) but when we get to meet the baby, the empowering glow on Bridget’s face is awesome (you can’t help but smile too) and baby has a nice coat of vernix on it – high 5 to the researchers!! Of course, there are many ways that this film could have improved upon its portrayal of birth but there were definitely some positives. Whether you want a Bridget Jones style birth, something much more Zen or perhaps something more organised (!) come along to one of my FREE Hypnobirthing Taster sessions to find out how (oh and definitely check out the film!). I’m Fi, I am 35 and work in Human Resources. I enjoy keeping fit (I go to the gym regularly) and love reading, I have to confess I love the Twilight books and films, hence my choice of of baby name!! 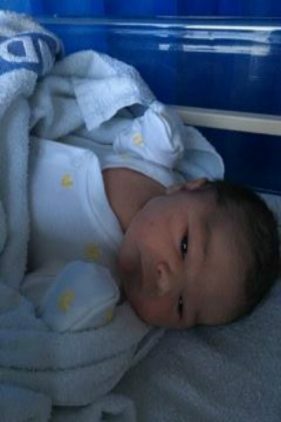 My husband and I have been trying for a baby for some time and we were thrilled when I gave birth to Edward on 25th August 2013, he is my first baby but I have 9 nieces and nephews so I have been around children a lot and was at the birth of one of my nieces so had first hand so experience of labour and birth. How did you discover Hypnobirthing and why did you decide to do it? A friend of mine had done hypnobirthing for the births of her two children and had told me about what a wonderful experience the births had been. To be honest, I didn’t really believe her, I mean, giving birth is painful, right? However, when I found out I was pregnant I asked her again about hypnobirthing so she lent me the Mongan method book to make up my own mind. The book just made so much sense my husband and I decided to speak to a hypnobirthing practitioner. I found Liz Standford’s details in the prenatal unit at the hospital so dropped her an email. Liz came back to me straight away and we arranged to meet the week after for a pre consultation. On meeting Liz, we felt really comfortable with her (she is really normal) so decided that we wanted to give hypnobirthing a go and agreed to have one to one classes that would fit in with our busy schedules. How did you feel about birth before the classes and how did you feel about it after the classes? Before the classes I still believed that birth would hurt….’a lot’ and kept referring to ‘pain’ all the time. The classes gave me some great tools to help with my pregnancy and the confidence that I could control any discomfort, I know it may sound strange, after the classes I was really looking forward to the whole experience of labour as I knew at the end of it I would have a wonderful little baby. What were other people’s reactions to your doing Hypnobirthing and how did you deal with that? The majority of people I spoke to were very sceptical and told me that it would hurt no matter what (they thought I had turned into a hippy). My sister, who has had 3 children, thought it was a load of rubbish and labour would be awful. I actually stopped telling people in the end as they all liked to give me their own horror stories. Shortly before the birth, I spoke to my cousin whose friend is a midwife who said that the best births she had assisted with were hypnobirthing. That filled me with confidence that I was doing the right thing and ultimately I didn’t worry about the views of others. My husband and I developed an excellent rapport with Liz and we had lots of fun and laughs whilst learning some important hypnobirthng techniques. Liz was very attentive and patient in answering all the random questions I tended to ask. If she didn’t know the answer, she would always find out the answer and come back to me the following day. The classes were really enjoyable and worth every penny. What did you find the most challenging thing about the course? I think the most challenging thing I found about the course was being disciplined enough to listen to the affirmations and rainbow relaxation every day. I tended to listen them when I went to bed and I would be asleep within minutes and wake up at the end! 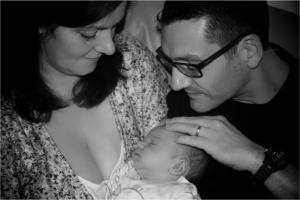 When the time came for you to give birth, how do you feel that Hypnobirthing helped? I don’t know if I can put into words how much hypnobirthing helped when I went into labour. I was calm, kept relaxed throughout, verging on sleep at the end stages! My husband knew what to do and was great at talking me through each stage and keeping me relaxed. My very sceptical sister happened to be staying at my house the night I went into labour and whilst my husband tried to get some rest (my waters broke at 12am!) she helped time my contractions. She couldn’t believe how quiet and in control I was and has completely changed her opinion on hypnobirthing telling everyone she couldn’t believe how calm I was and that I wasn’t screaming during the contractions! Other than using Hypnobirthing for giving Birth, were there any other benefits to doing the course? I am able to apply the techniques learned in hypnobirthing to many stressful situations and I think it helped me keep calm at work during my pregancy in general. I think it has been a major factor in having such a calm, happy and contented baby from the moment he was born. Finally, what would you say to Mums reading this, who are thinking about doing Hypnobirthing but are worried that it might not be for them? Do it! Just give it a go and you will be pleasantly surprised, you will not regret it. Just make sure if you do, you give it 100%.